Before we begin, let’s have a look at some of the terms that should be clear to us in order to start working with the BOMIZER system. The latter does not seek to represent all the possible uses of materials by means of various technologies of furniture manufacture; however, we believe that we have managed to cover the major part of technologies used in the manufacturing process of frame furniture. In BOMIZER, all materials are grouped into base materials and coatings. 1. “Profile”can refer to any material measured in units of length: kitchen countertops, various sealing profiles, aluminum door profiles, etc. 2. 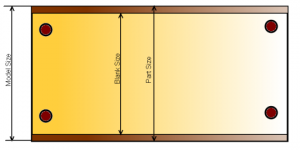 “Board”can refer to materials measured in units of area: boards, glass, laminated wood panels, flat tin parts, etc.
. “Volumes”are materials measured in units of volume: usually, these include pieces of wood, laminated wood, etc. In the database (warehouse), volumes are referred to as Timber. When assigning materials to the appropriate groups, we have defined behavior of parts when various coatings are applied in the SketchUp environment. Also, units of measurement of the specific material to be used in the Bill of Materials are indicated. When edge banding the selected edge of the part, keep in mind that BOMIZER plug-in takes into account the thickness of the edge used, when calculating the size of parts. BOMIZER plug-in automatically calculates the Blank Size, subtracting the edge thickness from the Model Size. We also assume that Part Size is equal to the Model Size. In other words, when designing a model, part size should correspond to the size of the part including the edges. Meanwhile, the cutting size of the blank will be calculated automatically. Laminated board is treated as a separate material. Laminated board is a chipboard covered with laminate, and is defined as a separate composite material. This material is purchased as a single product and BOMIZER users do not identify it separately as a board and laminate in the generated reports. In the reports, laminated board is identified as a board of specific thickness covered with a specific coating, which has to be bought in order to manufacture the designed piece of furniture. 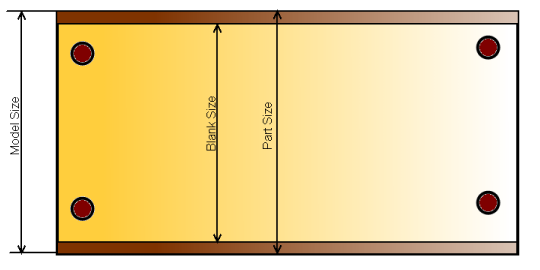 If the user covers the board with a laminate or veneer of their choice, and wishes to determine the quantities of individual materials, they should first assign the selected board material to the component (part) and cover it with veneer later. 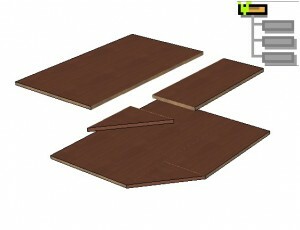 In this case, quantities of the board and veneer will be specified in the Bill of Materials separately. So, when working with BOMIZER plug-in commands, we can assign the base material to any component (part) of SketchUp and cover it with the desired coatings. BOMIZER plug-in collects data in an appropriate manner and in accordance with the contents of the project file, and presents them in the Bills of Materials. To this end, BOMIZER offers the possibility to assign various types to combinations of components (combined components). This assignment is controlled via toolbar. 1. Normal type encompasses combinations that are listed as separate entries in the Bill of Materials, including all their component parts (components). Any component that consists of component parts with the assigned BOMIZER plug-in materials is by default considered a normal component. 2. Phantom combinations include combined components designed only for ease of use in the SketchUp environment, which do not have to be listed in the Bill of Materials in a separate line. 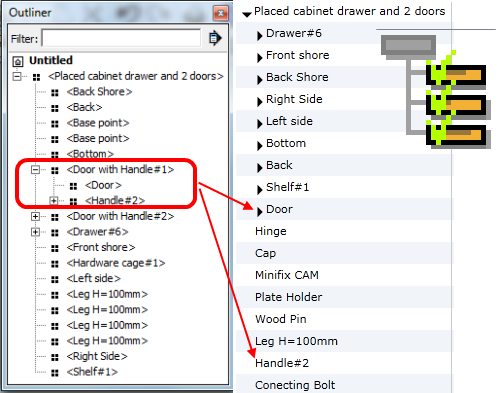 For example, sometimes it is convenient to combine doors and a handle into a single combined component, when designing dynamic blocks, at the same time including separate entries “Door” and “Handle”, rather than combined component DoorwithHandle in the Bill of Materials generated by BOMIZER plug-in. To achieve this, Phantom type should be assigned to the finished combined component. 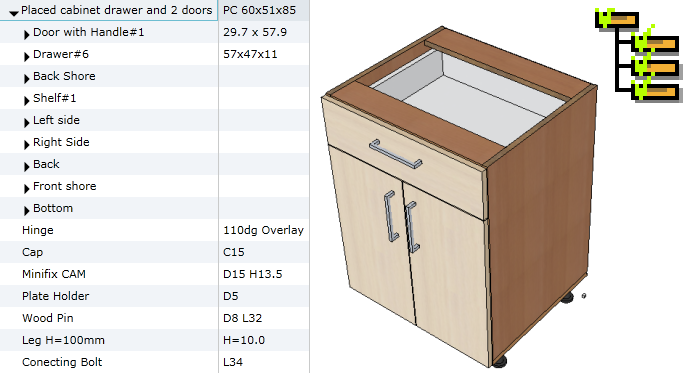 The image shows how SketchUp Outliner analyzes the combined component “DoorwithHandle” and shows its structure. Meanwhile, on the right side of the image you can see BOMIZER Bill of Materials browser that ignores the combination “DoorwithHandle”, because it was marked as Phantom. 3. Composed type includes combinations of items created by assembling individual parts. It is different from the normal combination of components, because this combination undergoes additional technological operations after the assembly, for example, calibration in accordance with the final measurements, edge banding, painting, etc. Such combination can be called a composite part. Such parts may include porous countertops, calibrated and edge banded furniture boards composed of several panels glued together. Rules for composing such parts in the SketchUp environment are listed in section “Working with Composite Parts”. 4. 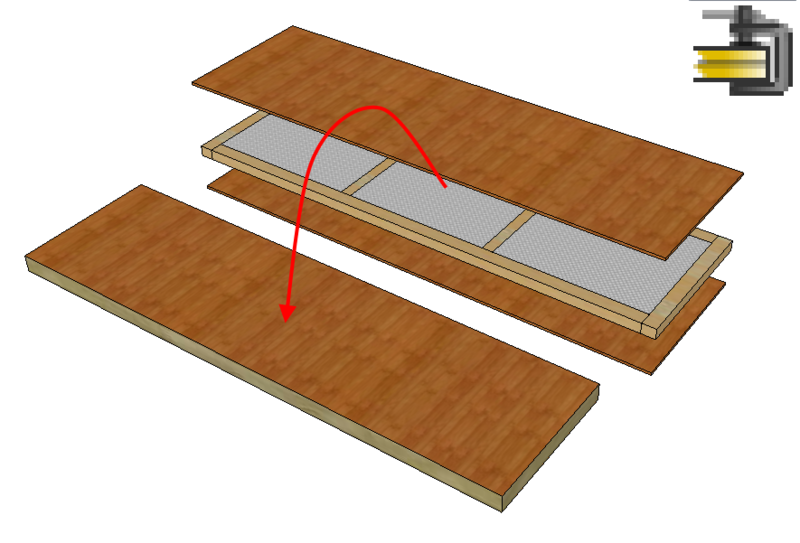 Inseparable combination is used when several SketchUp components have to be treated as a single component. This applies to dynamic components. To create a dynamic component of more complex geometric shape, whose geometry appropriately responds to changes in the dimensions of parts, it is necessary to compose it of several components. If you want BOMIZER plug-in to treat such combination as a single part, then it is necessary to mark such combination as inseparable. Below you will find a dynamic component of a cabinet bottom, which can be deformed lengthwise or crosswise, but the face remains of the same size. As you can see, such component is made up of several components. 5. Purchased type is used when you want to see the item in the purchased products section of the Bill of Materials generated by BOMIZER. 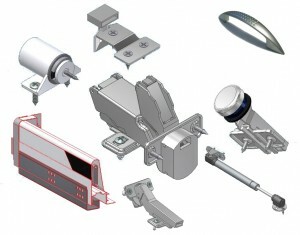 This includes various types of fittings: rails, handles, hinges, etc. 6. Unrecorded component is the component that we do not want to see in the BOMIZER Bill of Materials. Such components may include building walls designed in the project, decorative interior accessories (flowers, books, etc.) and auxiliary components designed for easier positioning of other components (base points of the component). If no BOMIZER material is assigned to the component or the component has no type (eg. Purchased Product), it is automatically treated as unrecorded. Hardwarecage. The component structure of BOMIZER encompasses a special component, i.e. Hardwarecage. Attachment fittings or other accessories that do not affect the rendering of the item can be constructed not as a separate component with its own bulk model, but as a set of attributes of the special component, i.e. hardware cage. This helps to save the designer’s time, because this eliminates the need to create a separate model for each component. To create attributes in the SketchUp environment, it is necessary to purchase SketchUp Pro. Another way to create component attributes is free-of-charge RickWilson Atributes v.1.000 software. The main difference between component attributes created with RickWilsonAtributes v.1.000 software and dynamic component attributes created with SketchUp Pro software is that attributes created for dynamic components using the latter software can be “smarter”. For example, if a variable number of shelves is provided for dynamic component, this means that the number of brackets depends on the selected number of shelves. It is easy to link the variable value determining the number of brackets in the attributes of the dynamic component with the number of shelves specified for the dynamic component. The first characters of the component name must begin with “HardwareCage”. Code_n– fitting code is included. Name_n – fitting name is included. Qty_n – quantity of fittings in the item is included. Where n is the original serial number of the entry in the hardware cage. The animation above shows how to create a component of hardware cage, fill in the required attributes of the dynamic component, and how it is saved in the library for further use, when it is included in the structure of an item. Finished hardware cage has to be included in the model of our piece of furniture. Now you can see that BOMIZER Bill of Materials generator reads the data stored in the hardware cage and includes them in the generated Bill of Materials. Following the above rules, you can change quantity attributes or add new components. All of these changes will be reflected in the reports generated by BOMIZER Bill of Materials generator. When viewing the structure of the item in BOMIZER structure, PartsOnly, TotalMaterial reports, the hardware cage is not included in the BOMIZER Bill of Materials generator. In this case, only the fittings included in its attributes is shown. If the quantity of any hardware element is “Qty_n=0″, such element is not included in the report. Such piece of furniture can be saved in your library and used in the interior design. If several pieces of furniture are added to the hardware cage during one session and you want to see the added hardware cage as a different structure of each piece of furniture, it will be necessary to mark the hardware cage component as unique after adding it. This can be done by selecting the hardware cage component and opening the context menu (right-click the mouse), where the component can be marked as unique (MakeUnique). When creating attributes with RickWilsonAtributes v.1.000 software, it is necessary to create a category for attributes in Bomizer plug-in. Only then, you will be able to create attributes as described above.